Home › Islam › Britain’s far right need an education. Badly. Britain’s far right need an education. Badly. 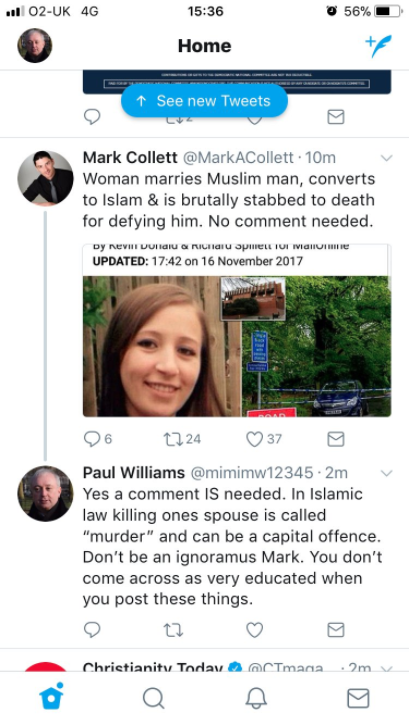 It is truly reprehensible for Mark Collettfor shamelessly exploit this tragic crime to spread his own anti-Muslm bias and Islamophobic sentiments. Why didn’t you post the whole verse of Surah 5:32? It’s a decree for the children of Israel, the Jews. Doesn’t apply to Muslims. Nice try. CONTEXT!!!! You Muslims love shouting it whenever others are scrutinising your scriptures and yet here you are distorting and ripping a passage completely out of it’s context in order to prove some kind of point. Stop being a disingenuous little Muhammadan and be honest for once! LOL, there goes the pretend-expert trying to act like he can educate Muslims on what the Quran says! Sammie, you should spend more time contemplating why you worship an aging Canaanite god and leave the Quran to us Muslims. Now go back to worshiping your Canaanite mangod. The point went completely over your head again. I was pulling Ibn Issam up on his deception dumbass. He purposefully distorted and edited the part about it being a decree FOR THE CHILDREN OF ISRAEL ripping it from it’s context. Why is your fellow Muhammadan chopping and changing the so called literal words of your god? LOL, sammie you sound mad. I understand. You’ve been embarrassed too many times to count. Listen carefully, moron. Brother Ibn Issam was not wrong to quote 5:32. The message is exactly the same as 6:151, which is not to take life unless it is for justice. 5:32 even says “unless it be for manslaughter…” The meaning is the same as 6:151, even though 5:32 was specifically referring to the command given to the Israelites. This verse actually completely refutes your Bible, which claims that God commanded the Israelites to kill babies. It debunks your pagan Canaanite book as the work of Satan. Sadly, Mark is only doing what many others do after every violent crime involving or reportedly involving a Muslim: trying to connect it to Islam. The fate of Mauritanian blogger Mohamed Cheikh Ould Mkhaitir, whose death sentence for affronting the Prophet Muhammad was commuted to two years in prison after he repented, continues to inflame public sentiment. In a France 24 TV debate, which aired on November 13, Mauritanian political activist Abd Al-Malik Ahmad called for Mkhaitir to be executed despite his repentance, saying that “after he is killed, he can be buried like a Muslim.” Moroccan human rights activist Abdel-Samad Ayat Aesha confronted him, saying that “calling to kill a person for expressing his views is the mentality of ISIS.” Mkhaitir, whose 2014 article criticizing the use of Islam to justify Muaritania’s caste system led to his arrest, later repented, leading to the commuting of his death sentence to two years in prison, which he had already served. Following the court verdict, mass demonstrations were held, calling for Mkhaitair’s execution. ….against injustice for which “sedition in the land” is a catch-all term which probably includes being disobedient to the male patriarchal authority. My own view is that honour killing is patterned after the example of Mohammed who had those killed who caused him to publicly loose face. Such as the poets and singers. It was simply imperative for someone who had a public position of authority to restore his honour. The West has other laws, for now. LOL, so it “probably” includes it, huh? Is that an opinion or a statement of fact, stupid? Ah, I guess that answers my previous question. Ignoramus is merely stating his opinions, so no one needs to take him seriously. “It was simply imperative for someone who had a public position of authority to restore his honour. Exactly, just like the high priest. LOL!! !